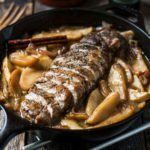 This apple pork tenderloin recipe is easy to follow and delivers juicy meat surrounded by soft caramelized apples and onions. Tantalizing cinnamon spice, caramel notes and complex sweet and savory flavors coat the palate with every bite. 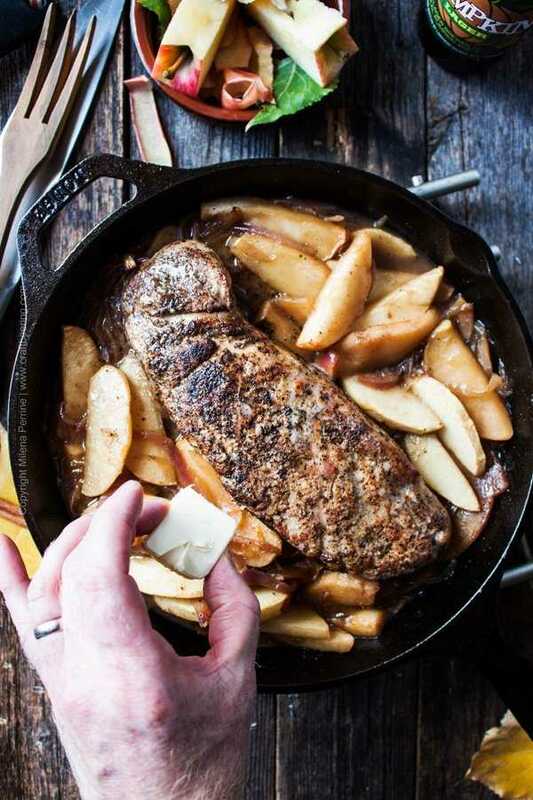 Just a few simple ingredients as a matter of fact and a cast iron skillet and you will be on your way to the glory of pork tenderloin with apples and brown sugar. You could also prepare the dish using a slow cooker and we include instructions on how to do it in the recipe card. apple cider/juice or pumpkin ale – you can make this dish year round and use apple cider or apple juice but when in season – we recommend pumpkin beer. TIP: Pumpkin beer as the liquid of choice adds so much flavor. For this post we used Lakefront Brewery Inc. Spiced Pumpkin Lager (one of few pumpkin lagers brewed in the world, usually pumpkin beers are ales). It is very rich with intense spice notes and sweetness, yet dry and beautifully brings out the flavors of the pork. NOTE: If cooking a larger piece of pork tenderloin you definitely need to use a larger heavy bottomed skillet and increase the rest of the ingredients (simply click on the servings number in the recipe card below and slide the bar, the ingredient amounts will adjust. 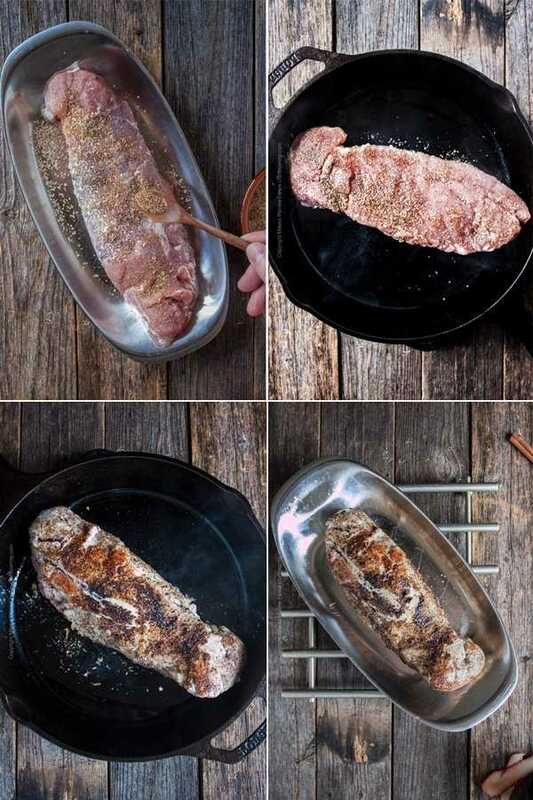 Mix the salt, pepper and ground cinnamon to create a rub for the pork tenderloin and set aside. Peel and slice the apples (leaving the skin on a few slices is a good way to add a varying texture element; optional). Be sure not to slice them too thin because they will turn to mush during cooking. Thinly slice the peeled onions. 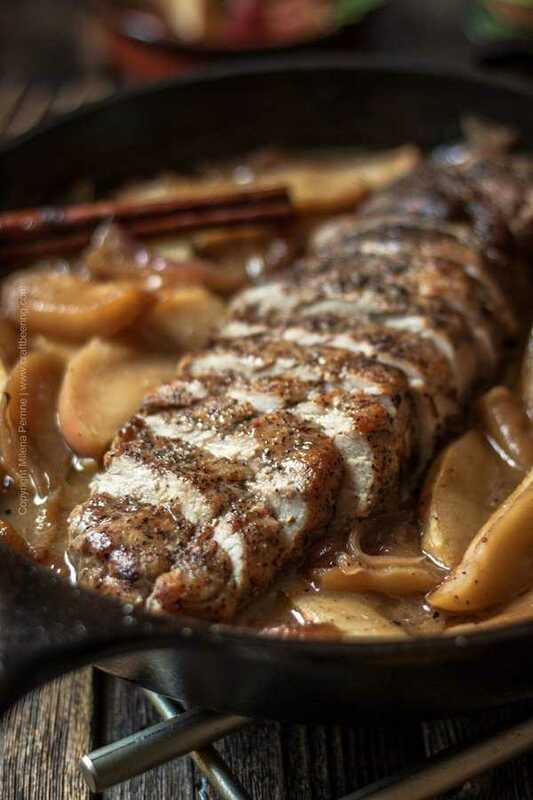 NOTE: Before you proceed with the steps involving the apple pork tenderloin, we recommend that you remove the silverskin. The silverskin is that thin, white membrane layer you can see in the ingredients picture above that covers the side toward the end of the pork tenderloin. It is helpful to remove it because it shrinks with heat and pulls on the pork causing it to twist in a bow shape. Watch this excellent video demonstration on how to remove silverskin from pork tenderloin by our friend Jennifer from Seasons and Suppers. Season the tenderloin liberally but not excessively on all sides with the salt, pepper and cinnamon rub. Heat your cast iron skillet over medium high heat and add a tablespoon of cooking oil. Then sear the pork tenderloin on all sides – about one minute per side. This will create a ‘seal’ and lock its juices in, ensuring it remains moist and flavorful during the cooking process. 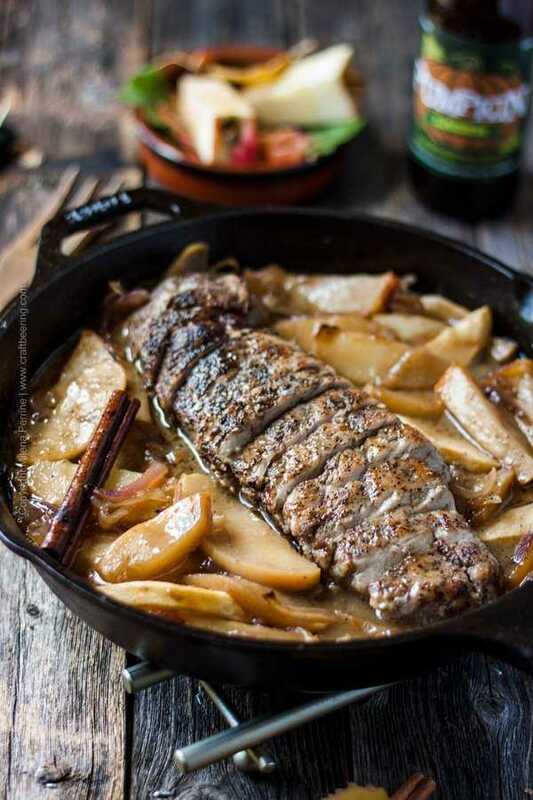 Once the pork is seared remove it and set it aside while you turn your attention to the apples and onions. Add a bit more cooking oil to the same skillet and cook the onions until translucent, then add the apples and mix them with the onions. Saute for 2 minutes. Add the cinnamon stick (if using) then sprinkle brown sugar and stir. Next comes our favorite moment – pour that pumpkin beer (or apple cider/juice) to deglaze the pan and form the base of the delicious sauce in which the dish will bake. Just love the sight of how the beer bubbles up … and the aromas, too. Finally place the seared pork tenderloin back in the skillet and bake at 375 F.
The pork should be done in about 20 mins (a bit longer if you have a larger piece). Pork tenderloin doesn’t have to be cooked to 155 F like most other cuts or pork. Look for internal pork tenderloin temp of 140-145 F when measured with food thermometer in the center of the meat. Once out of the oven add the butter cut in small pieces on top of the apples and let it melt while you allow the pork to rest a little bit. Take out the meat to slice it and baste the apples with the sauce in the pan (made silkier from the melted butter). Return the sliced pork to the skillet and serve. We made tandoori seasoning rice with sultana raisins to accompany our baked pork with apples and onions. The flavors complemented each other famously. Since we are very low key most of the time we served the pork in the skillet to share family style. This dish however lends itself to elegant individual servings and the complex flavor profile it delivers certainly merits a fancier presentation. TIP: To make the same rice as ours combine 1 cup of Jasmine or Basmati rice with 2 cups of water, 1 tbsp butter, 1 tsp of tandoori seasoning and 1/3 cup of sultana raisins in a pot. Stir, cover with lid and cook on medium heat until the water is absorbed (about 10 – 15 minutes). Remove from heat and let sit covered. Fluff with a fork right before serving. 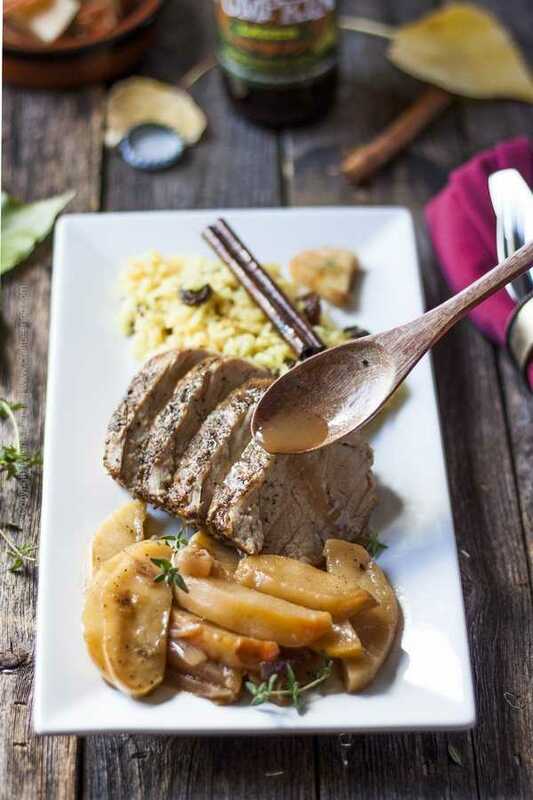 Tender and juicy pork tenderloin, seared and baked in the luxurious company of caramelized apples and onions. All that with an elegant sauce for which you can use pumpkin ale, apple cider or apple juice. 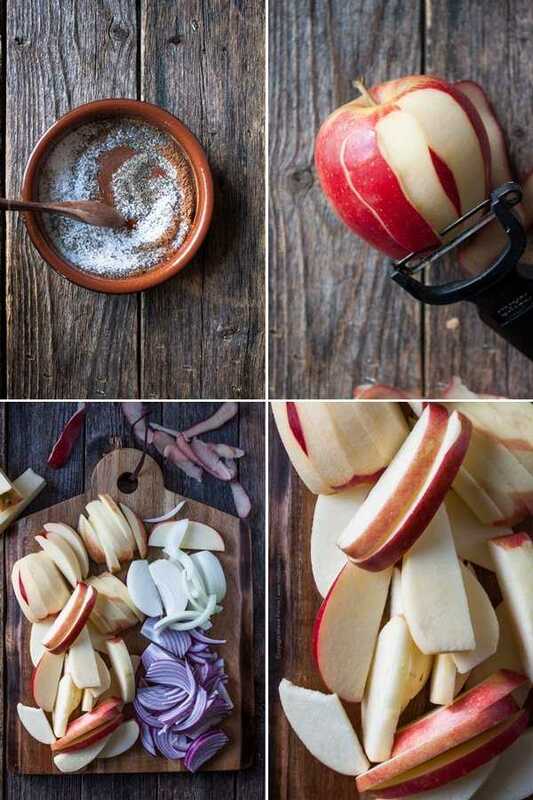 Turn the oven on to 375 F.
Peel and slice the apples and onions (apples not too thin, onions thinly sliced). Mix the salt, pepper and ground cinnamon to create a seasoning. Remove the silverskin from the pork tenderloin (see post for details) and season it liberally with salt, pepper and cinnamon. Heat 1 tbsp of cooking oil in an appropriately sized skillet over medium high heat. Sear the seasoned pork on all sides, allow 1 to 1 1/2 minutes per side. Remove it from the skillet and set aside. Lower the heat to medium and add 2 tbsp of cooking oil to the skillet. Saute the onions until translucent (5 mins). Add the apples, stir and saute for 2 mins. Add the cinnamon stick (if using) and sprinkle the brown sugar. Stir. Pour the pumpkin ale or apple cider to deglaze the pan, stir for about 1 min and remove from heat. 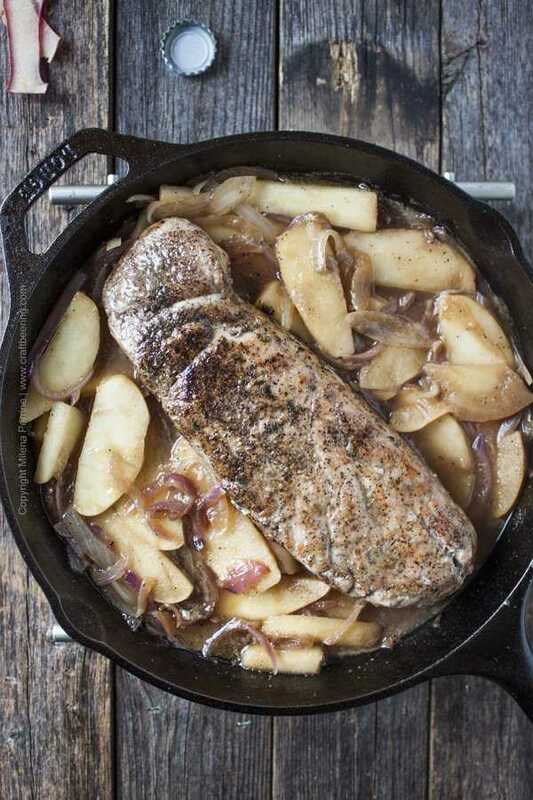 Place the pork tenderloin in the center of the skillet and bake for 20 minutes or until the internal temperature measured in the center of the meat registers 140-145 F.
Take out of the oven and place the slices of butter over the apples. Let the pork rest for 3-5 mins while the butter is melting. 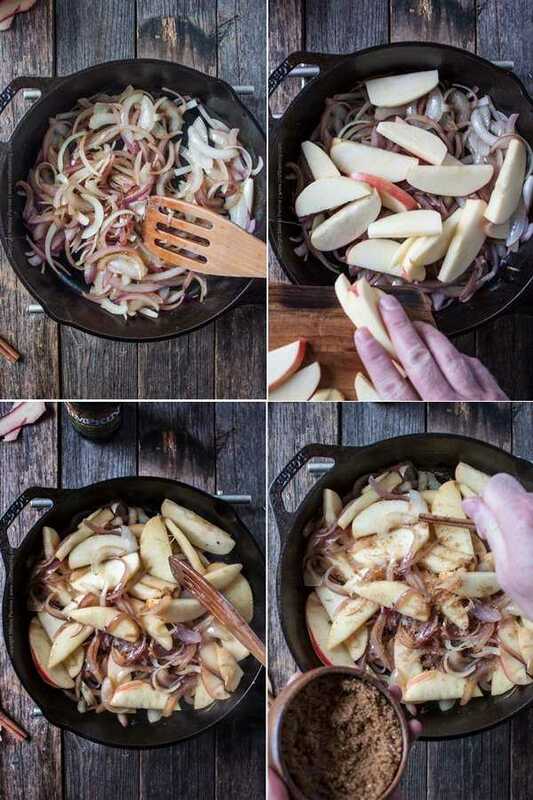 Take the pork out and slice it and then either add it back to the skillet to serve family style or serve on individual plates with a drizzle of the skillet sauce and spoonful of the apples and onions. Season and sear the pork tenderloin as described above. Place in the slow cooker. Toss the sliced apples and onions in brown sugar and 1 tbsp of oil and surround the pork with them. Add the pumpkin ale or apple cider/juice. Scatter the sliced butter around the pork. Cook on high for 2 hrs or until the internal temperature registers 140-145 F. On slow allow up to 4 hours, more if your pork is larger. Using pumpkin ale versus apple cider or apple juice adds an amazing complexity of flavors and aromas and really elevates the dish. Chef note: 140 - 145 F is a safe pork tenderloin temp. No need to cook it to 155 F internal temperature as required for other cuts of pork. Best served with rice or over mashed potatoes. First time cooking tenderloin in a skillet in the oven like this and all worked great. The apples were delicious with the meat. I bought apple cider and also addes a litle nutmeg and onion powder to the spice mix in the begining. Will make it again. There isn’t any part of this dish that isn’t just perfect! Love it!! I’m so wishing I had pork tenderloin in the fridge because I would love to have this for dinner tonight! 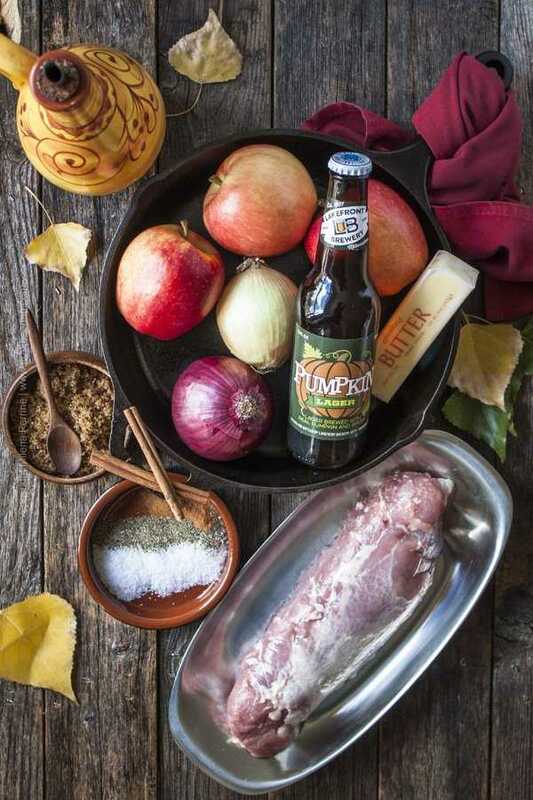 Talk about channeling all the delicious fall vibes with pumpkin ale and apple. Can’t wait to try this one soon 🙂 I’d want lots of rice to soak up all that yummy sauce. Pinned! A fabulous meal. 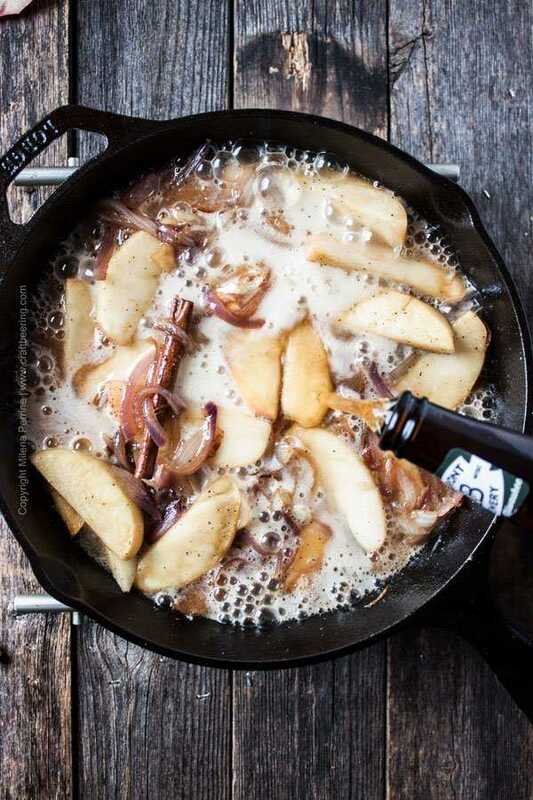 Love the apple and onion braise. Now I need to go buy some pumpkin ale! 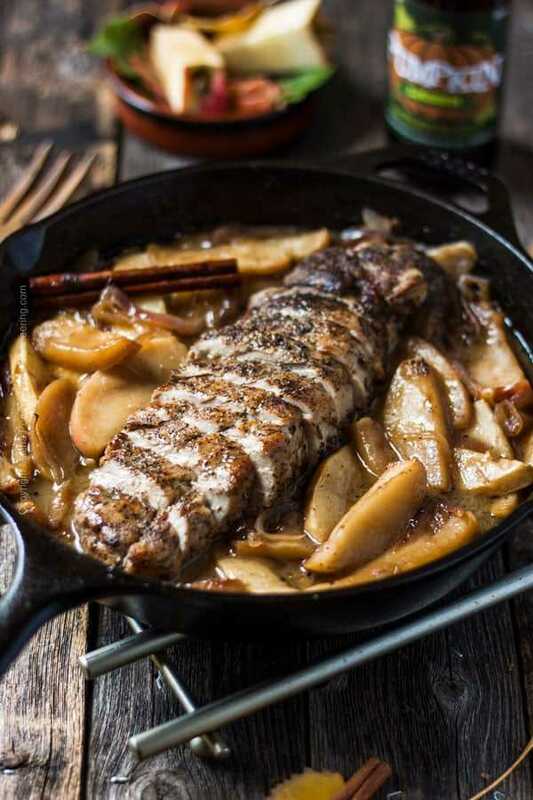 I am a pork tenderloin lover and always looking for new ways to enjoy it, so I’m loving this one 🙂 Apples and pork go perfectly together and so perfect for this time of year! Thank you, Jennifer! Yes, definitely great for Fall and the pumpkin ale flavors are such fun to experience in this dish!